"Casual fare — beef and noodles, chicken and dumplings, and sandwiches like a vegan B.L.T. — are served at this all-day cafe and wine bar from married partners, the chef Megan Johnson, who worked at Gramercy Tavern, among others, and Jen LaPorta. The restaurant also has a retail store for prepared food and goods..."
"If you’re in the mood for comfort food, Hudson Jane NYC is the place to be. Chef and owner Megan Johnson is setting the bar high with an American favorite – the crispy hash brown. Yep, she’s using this fried potato masterpiece..."
"The sunlight flooded in through the massive windows of Hudson Jane last Sunday afternoon as the new all-day café/restaurant/wine bar was abuzz with brunch. I’d been looking forward to Hudson Jane’s opening for quite a while, and it appeared that I wasn’t alone. All of the ten or so tables were filled in the eatery, and a few parties patiently waited outside for room to open up. The spare design of the space is modern and clean, much like Chef Megan Johnson’s [...] spin on American comfort food." "...Hudson Jane, which opened Monday at 360 Myrtle Ave., has it all, it would seem. A cafe counter that offers quick food and coffee to to go? Check. A sit-down restaurant that functions as a wine and (wine) cocktail bar at night? Check. Breakfast, lunch and dinner? Check, check and check. "Over on the border of Fort Greene and Clinton Hill, this all-day café is open and, frankly, the whole place just looks so damn charming. (Also, they have a hash-brown sandwich that is almost certain to pop up on your Instagram timeline in the near future.)." "Coming at you hot to Brooklyn’s happening Fort Greene neighborhood is Hudson Jane. [...] Designed by Masterson Architecture & Design (Atrium Dumbo), the interior space was created to appeal to both aesthetics and utility; a functional space that can also serve as a simple backdrop for the vibrant food. Accented by antiques collected by Megan and Jen over the years, the personal items give the restaurant a cozy touch." "...Fort Greene’s new Hudson Jane goes against the grain for its lack of gimmicks. This all-day cafe from partners Jen LaPorta and chef Megan Johnson (Gramercy Tavern, Casellula) is just an old-fashioned restaurant with breakfast through dinner, plus a grab-and-go retail section...."
From partners Megan Johnson (previously at Gramercy Tavern, Gottino and Casellula) and Jen LaPorta, this all-day gathering place in Fort Greene pairs elevated American comfort fare – crafted using local ingredients – with an all-natural wine list, craft beers and coffee drinks from Counter Culture Coffee. The minimalist, functional setting features white oak accents and pegboard rails. "A park bench at the corner of Manhattan’s Hudson and Jane streets marks the starting spot of chef Megan Johnson and partner Jen LaPorta’s relationship, and although their restaurant is in Fort Greene, their relationship is cemented in its name. 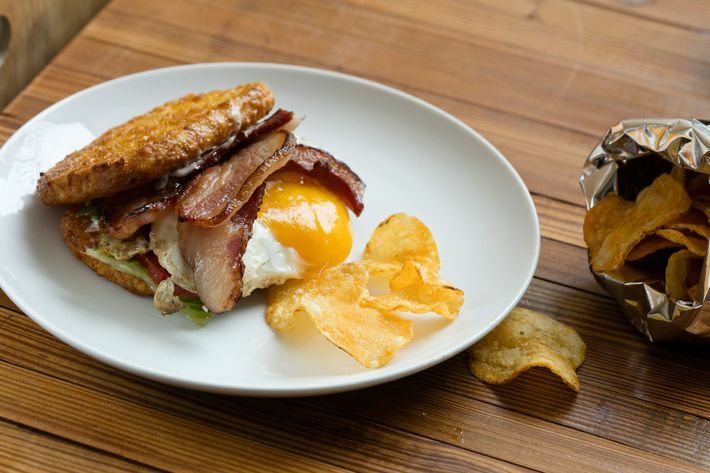 The all-day eatery kicks off mornings with breakfast sandwiches and vanilla-custard French toast sticks, followed by hefty melts and salads for lunch and comfort food staples like bacon-wrapped cheese curds and a grass-fed burger for dinner.